According to a recent Nielson Study, people in 58 countries were asked to answer the following question: To what extent do you trust the following forms of advertising? It’s not surprising that we overwhelmingly trust recommendations from people we know because we expect them to be transparent. Overall, increased trust in other forms of advertising has occurred during the past six years because advertisers understand that in a socially connected world, there are more people sharing their opinions about marketing. As a result, marketers must be more respectful and transparent with consumers. McDonald’s took great strides to be more transparent with its “Our Food. Your Questions.” campaign. In one segment, viewers were taken behind the scenes at a Big Mac photo shoot to answer this consumer question: “Why does your food look different in the advertising than what is in the store?” It was a refreshing attempt to connect with viewers and be more transparent (and it received over 9 million views!). The campaign is also currently cleaning up at the award shows. Social Media has also changed the way brands respond to current events, including tragedies. Kmart attempted to reach out to its loyal followers on Twitter to offer its condolences to victims and families of the horrific tragedy at Sandy Hook Elementary School in Connecticut. Unfortunately, Kmart made a terrible mistake in adding a hashtag pushing its Fab15Toys. The backlash was immediate and strong and the transparency of its condolences was questioned. There are a number of examples of organizations using topics that pull at our heartstrings to increase engagement and traffic online. The Inquisitr took things too far when they asked people to add a “Like” if they wished Cancer didn’t exist. Is the motivation to fight this terrible disease? If so, how will generating likes to your Facebook page contribute to this fight? We learned earlier from Nielson that 68% of people trusted online reviews. Samsung had decided to take advantage by paying people to write negative reviews about a competitor’s mobile device. The fine levied was a paltry sum for an organization that exceeded $140 Billion (U.S.) in sales in 2012. The damage to Samsung’s trust and transparency will likely be the greater impact. 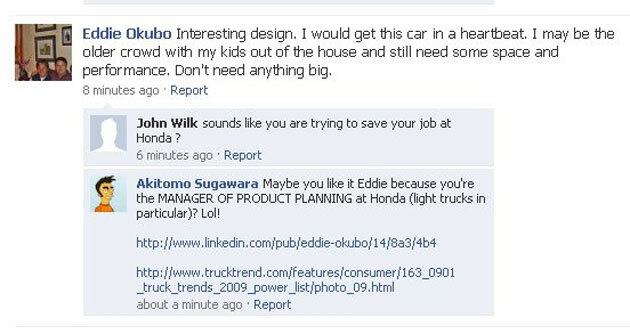 An otherwise typical posting on Facebook from Eddie Okubo praising a new Honda vehicle faced a backlash from consumers when it was discovered that he was Honda’s Manager of Product Planning. Readers took it upon themselves to expose the obvious lack of transparency and even went as far as to post Okubo’s LinkedIn profile. Sometimes the ultimate transparency is admitting when we’ve made mistakes. A Customer of Jimmy Johns turned to Facebook to complain about their order. Jimmy John’s approach to a customer service issue was to admit fault and make it right. The increase in trust from Jimmy John’s transparency is difficult to measure in numbers, but it likely saved a customer and added a few more as a result. Be honest - the truth will come out when thousands of people have the ability to call you on your motivations and facts. Don’t use tragedies to further your online engagement - be sincere and transparent if you want to show your sympathy on behalf of your brand (e.g. We’ll match your donation vs. Click “Like” if you agree). Your personal opinions, when there is a conflict of interest, can ultimately hurt your brand image (e.g. the Honda example above). When you’ve made a mistake, just admit it, and don’t repeat the mistake. That’s a true sign of strength and transparency.